I guess you can say I am on a wreath kick since the heart shaped rose wreath that I shared last week. I have been loving all the burlap wreaths I have been seeing in blogland and have been longing to make one for awhile. I used a wire wreath frame for this and used a combination of the techniques from Sarah’s tutorial on Becoming Martha and Laura’s tutorial on Top This Top That. I thought felted flowers would be the perfect embellishment for this. The texture goes so perfectly with the burlap and I also don’t have to worry about them getting ruined by the moisture outside. I worked the flowers up with Cascade 220 wool yarn. The large rose is from this pattern that a shared a couple weeks ago. But the buds and leaf patterns are below. Click here to reference the Crochet Abbreviations Chart. Click here for the large rose pattern. Row 1: Work 1 sc in 2nd ch from hook and each ch across — 14 sts. Row 3: Ch 1 (does not count as st), work *1 sc in first st, 1 dc in next, 2 tr in next, 1 dc in next, 1 sc in next, rep from * across, work 1 sc in last st — 25 sts. Fasten off leaving a tail of about 6 inches. Now, roll the strip so that it resembles a bud and use a tapestry needle to weave your 6-in. tail through the bottom of your flower, making sure to go through all layers of the flower. To make the small bud, follow through Row 2 of the Large Bud pattern. Follow same instructions for fastening off. Round 1: Work 1 sc in 2nd ch from hook, 1 hdc in next, 1 dc in next, 1 tr in next, 1 dc next, 1 hdc in next, 1 sc in last ch, ch 4; working back along ch 4 just made, work 1 Sl st in 2nd ch from hook and each of the next 3 ch; working along opposite side of foundation ch, work 1 sc, 1 hdc, 1 dc, 1 tr, 1dc, 1 hdc, 1 sc in last ch, ch 2, Sl st into 1st ch made to join. If you would like to felt your flowers as I did here, you can reference my How to Felt tutorial. What a wonderful rose bud pattern. I can’t wait to try it out! Anyone tried this pattern? Left me hanging…..pleases explain….did I make a wrong turn some where? What are the instructions for after fasten off? I have a flat piece. Hi Sidney 🙂 Here are the instructions after Row 3: Fasten off leaving a tail of about 6 inches. Now, roll the strip so that it resembles a bud and use a tapestry needle to weave your 6-in. tail through the bottom of your flower, making sure to go through all layers of the flower. I can’t get to the pattern for the rose. It said to click ‘here’ but it didn’t work. I want to do the whole pattern with the buds and rose. It is just beautiful. I love the BL wreath. Thought this would be cute on hats too. Kara, I love these rose and rose bud pattern! 🙂 I noticed the link for the heart shaped wreath says Page Not Found. Just thought I’d give you the head’s up. 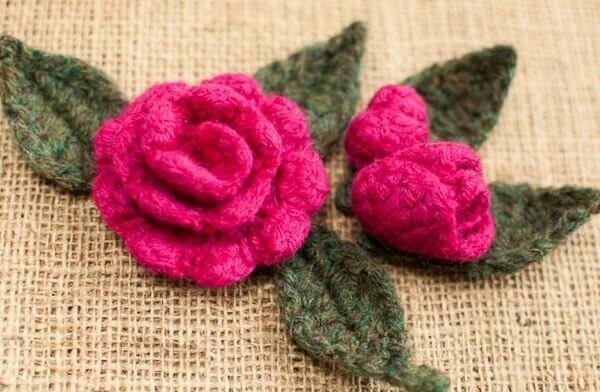 I have been looking for a rose bud pattern like this. The roses I have been doing kind-of look like other kind of flowers, even though they are pretty just not as pretty as these are. Esta precioso, gracias por el patron. ok did I Miss the spot where it says the hook size?? anyone know what size it is? Just gave you a shout out..Happy National Craft Month! So pretty I love this for spring! These rosé buds are very cute! :) thanks for sharing! Beautiful contrast between the fine flowers and rough fabric, lovely idea! Honestly, I would never get that fabric so perfectly equal folded ;-). Thanks for sharing! 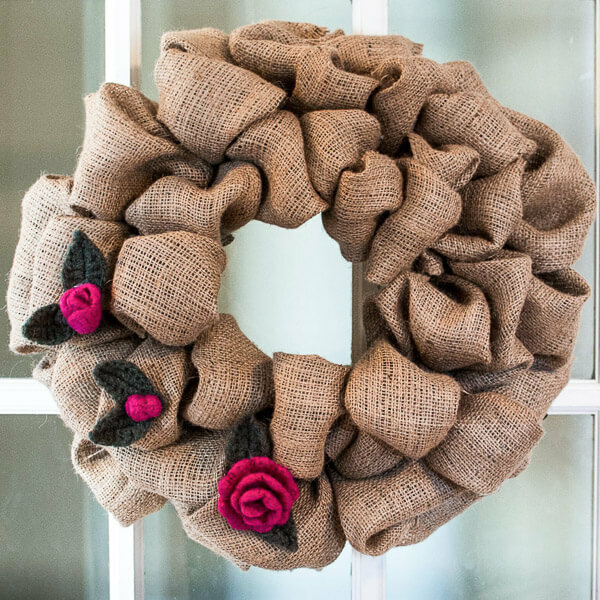 This is really gorgeous – I haven’t gotten into the burlap trend til now, I think this wreath might have changed my mind! Love the little roses too! Thanks for linking up on Hookin on Hump Day! This is so gorgeous! I just cannot envision a burlap wreath coming out that pretty if I attempt it, though… I HATE working with that stuff! Haha. But seriously, I LOVE this! You always make such beautiful things and are so generous with your ideas! Thanks so much! I have been wanting a classy yet inexpensive wreath for my door for ages now. This is perfect–especially since it will do well in the weather! Love your burlap wreath! Very pretty! great job on your wreath. Came out pretty. Thanks for linking back my tutorial. you are so talented and creative! You inspire me and I decided to follow you! I love the wreath, I love the rose bud! I am on a burlap craze right now and I must make one of these! Thank you so much for sharing this with everyone! I have a link party for recipes, crafts and Etsy shops – I would love it if you would bring this and any other crafts you would like to share! Thanks so much, see you there! What a great combination! Nice job. Would love to try this rosebud pattern. Thanks! Kara, es fantástica, me encanta, me encanta.